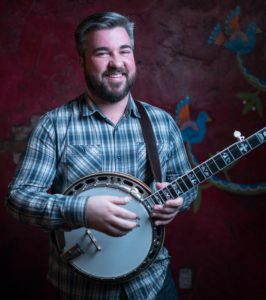 Patrick Sauber is one of the new breed of bluegrass pickers – talented, fast, inventive, creative, fluid, frictionless, highly developed fast twitch muscles, great singer – he does it all. Patrick plays guitar (he’s Roland White’s favorite Clarence White guitar stylist), banjos with the best, mandolins like it was his first instrument, and then can sing any part in any band. How could he not be that good, he had the great advantage of being the son of bluegrass and old time great Tom Sauber. He plays regularly in the Laurie Lewis Band.